Armed to its newly sharpened teeth and carrying the legacy of a legend, the Motorola RAZR XT910 is out looking for blood. The blood of the best Android phones on the market. And it will cut them where it hurts - their screens, chipsets, cameras and build. The 4.3" SuperAMOLED screen boasts higher resolution than, say, the Samsung Galaxy S II. It bumps up the pixel density to 256ppi (up from 217ppi). And with a dual-core processor running at 1.2GHz and 1GB RAM, it's got enough processing power to challenge the other dual-cores. It has an 8MP camera with 1080p recording too. But even those specs just aren’t as impressive as the sheer look of the thing. The RAZR droid is only 7.1mm thick throughout (take that Japan-only phones) and about 10.7mm at the bulge that holds the camera and loudspeaker. And by the way, the rest of the specs are pretty exciting too. Here's the best part of them - and the not so good. 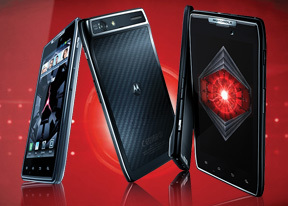 The RAZR may be thin but it's hardly fragile - it uses Kevlar to cover its back and Gorilla Glass to secure the front. It's splash-resistant too. Are the other droids shaking in their boots already? They should be - the Motorola RAZR has an impressive array of accessories by its side, including one that turns it into a full-fledged 14" Android-running netbook (full-size keyboard, Firefox browser, etc.). The expectations are high - with this many talents on its resume, the Motorola RAZR will try to slash other droid's hopes of being the best. But does it have the (retail) package for it? And is the hardware as good as it sounds? If you're not afraid of sharp objects, jump to the next page and find out. We've got our first aid kit at hand, just in case. Hold the power button down for 10 secs and it will reboot.. hope this helps you.